Georgy Cohen recently wrote an article on Meet Content about developing a strategy for content on a homepage. It is often argued that a homepage isn’t as important today because of how a user accesses content. 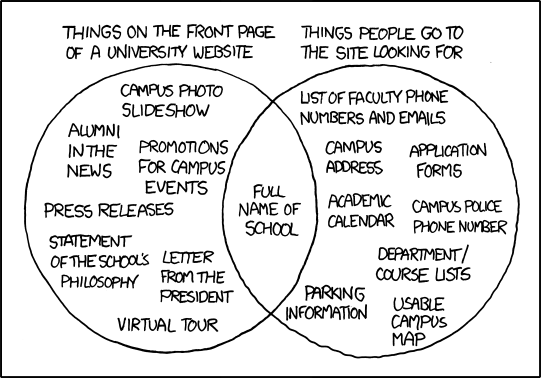 While this may be true for some websites, it is definitely a myth regarding academic library homepages. A well-built academic library homepage creates a positive brand statement and efficiently guides the user towards the needed content through consistent “information scent”. I think the following academic library homepages are noteworthy and are examples of well-organized content. Harvard Libraries: This recently redesigned homepage put the search tool front and center, but also provides descriptions of library jargon and academic sources. Initially I didn’t know what HOLLIS was but beneath the search box a quick description described the resource. I was also drawn to the red icons in the right resources sidebar. This breaks up the text and draws attention to popular services. Ithaca College Library: This homepage is one of my favorites because it is simple and efficient. This site only uses one drop down menu, while the rest of the toolbar resembles a mobile layout design, with key content, like books and articles, in large text. I was able to find the link to JSTOR in seconds. Marygrove College Library: This homepage is one of the few academic libraries that efficiently uses drop down menus. There are also only three columns of text which cuts down on unnecessary front page content which can often be distracting from the main toolbar. Northeastern University Libraries: This homepage also has a toolbar with numerous drop-down menus, but each item in the drop-down is paired with a one sentence description. This is most useful for the new library user or those unfamiliar with library jargon. Content Strategy: It’s what librarians already do. I have very little to add to this article but wanted to link it here because it is so, so good. As my colleagues know I have been on the content strategy soapbox of late, especially in light of our imminent website re-architecting/redesign. I’ve also been known to quote Ranganathan at unexpected moments, because his Five Laws of Library Science are still incredibly relevant to everything that we do to serve our users (and frankly, also because it’s nice that something I learned about in library school is still relevant – as opposed to, say, the pre-CSS HTML I spent hours hammering away upon!). So when I came across this article on the (always excellent) Brain Traffic blog by content strategist (and former academic librarian) Claire Rasmussen, in which she looks at the Five Laws and applies them to the work of content strategy, I found myself bouncing in my chair with excitement. (Yes, I am a huge nerd. This is firmly established. Can we move on?) Librarians who create content for the web should read this and consider how the principles of content strategy can help us to achieve the basic goals and principles for which librarianship was developed in the first place. It’s what we already do, and content strategy will help us do it on our website too. So read this, please, and if you have comments I’d love to hear them! Posted on June 7, 2012 May 21, 2014 by Author Anne Haines Posted in Categories Content Strategy, DUX Likes This, User Experience | Tagged: Tags content strategy, ranganathan | 1 Comment on Content Strategy: It’s what librarians already do. Clear communication is essential to delivering an excellent user experience, which is why we have a Website Editor (me!) in the Digital User Experience department. Who are you writing for? Different audiences respond to different terminology, tone, context. For example, if international students or stuffy faculty members are part of your expected readership, you probably want to avoid slang. Context. Where are your readers in the research process? What have they already read? Metrics can help you understand your readers – in the Libraries we use Google Analytics and Crazy Egg. How are they reading your content? People read differently on the web. They scan pages quickly. Mobile devices are heavily used, especially by college students. Will your content work on a smartphone or on a tablet? Does it need to? Content may be repurposed. It might be included on a class page, listened to via a screen reader, shared on Facebook or Pinterest, maybe even (gasp!) printed out on paper. Content structure and metadata make it easier for your content to flow into these various containers. Improved content management systems make this easier to accomplish. Be consistent – if the circ desk has no signage other than “Check Out Here” and your website tells users to go to the Circulation Desk, will they know where to go? Kristina Halvorson: Content strategy plans for the creation, publication, and governance of useful, usable content. To sum up: We need to talk to our users and listen to them so that we understand why they are here and what they need to do. We can then create calls to action that make sense to our users and help them fulfill their goals. There are many different ways that libraries can provide help and guidance to patrons in finding the information they’re seeking online. Web 2.0 applications, such as wikis and blogs, have become increasingly popular for this purpose. These tools deliver information about library resources and services while allowing users input via comments or (in some cases) editing privileges. Another way to help online users is via chat services, available now in many academic and public libraries. Instant messaging allows users to receive feedback and advice almost immediately with all the context and messiness of their question in mind. This is particularly useful for less common questions and unique situations. But by far the most ubiquitous online help resource is the FAQ. While the FAQ does not have the personal touch of an instant messaging service or the collaborative features of a blog or wiki, it has some distinct advantages. First, the large majority of users are familiar with the FAQ format. Many websites, whether commercial, personal, or informational, have an FAQ section. So if your patrons have used the internet before, they’ve most likely encountered at least one FAQ. Second, unlike a chat service, it does not require library staff to be immediately available. Although maintenance is a must (as will be discussed in further detail below), the FAQ is an independent animal that can, if properly constructed, be trusted on its own for a little while. That said, there are many situations in which an FAQ is not appropriate and there are an infinite number of ways to execute an FAQ poorly. In this A List Apart article, R. Steven Gracey is particularly critical of the FAQ. It’s not all condemnation for this universal help tool, however. Gracey also gives some excellent pointers on how to make an FAQ effective and (gasp!) helpful for users. When done right, the FAQ can be a valuable tool for library websites that supports good content by making it discoverable to users. Below I enumerate some points made by Gracey, and a few of my own, on how to create an FAQ that is not a crutch for bad web content, but a scaffolding for good web content. Make it easy to find. If your FAQ isn’t findable, you’re in trouble. Big trouble. People are looking for the FAQ because they can’t locate the information they’re seeking. If the FAQ is difficult to find, you will have grumpy users. Keep it manageable. The point of an FAQ is not to document every fact that can be found on your website. A scan of 112 academic library FAQs done at the University of Notre Dame revealed that some library FAQs had as many as 400 questions included. That’s too many. Period. Maintenance! Seriously. If your collections have changed, or if you’ve had turnover in your staff, of if you’ve moved the copy machines, or if the sun has risen, there’s probably something that’s out of date on your FAQ. Update and weed frequently. Add when needed. Make it searchable OR sort by category. No one wants to look through all 400 of your questions to find the answer they’re looking for. Allowing users to search or to scan categories makes the process a whole lot faster and less frustrating. Assume the user won’t find her answer. Never suppose your FAQ can address every question. Provide a link or contact information somewhere on the FAQ page where the user can go for further help. In Libraryland, this will most often take the shape of a link to the chat service (if available) or an email address for a reference librarian. This list is by no means comprehensive, and it is largely a product of my own experience with FAQs, rather than any kind of authoritative study. Questions (frequently asked, or otherwise) and comments welcome!